1. SUMMARY The Centennial Challenges Program is NASA's flagship program for technology prize competitions (www.nasa.gov/challenges). The program is an integral part of NASA's Space Technology Mission Directorate, which is innovating, developing, testing, and flying hardware for use in NASA's future missions. The Centennial Challenges Program directly engages the public, academia, and industry in open prize competitions to stimulate innovation in technologies that have benefit to NASA and the nation. For more information about NASA's Space Technology Mission Directorate, visit: http://www.nasa.gov/spacetech . The Centennial Challenges program is seeking input on a space robotics challenge proposed to start in 2016. The challenge focuses on developing robotic software to increase the autonomy of dexterous mobile robots, particularly those of humanoid format, for skills needed during future exploration and science missions, as well as advancing such capabilities for commercial terrestrial applications. The emphasis of this challenge would be to provide robot autonomy for two modes: supervisory control and autonomous control. In the supervisory control mode, a remote operator would provide a set of tasks through a mission plan, based upon a limited set of environmental information. The mission plan provided to the robot can only contain high level symbolic commands, e.g. pick up sampling instrument, descend ladder, turn valve, connect cable. No detailed articulation, component motion or manipulation commands (i.e. manual teleoperation) would be allowed. In the autonomous control mode, the robot would be provided with a specific goal, e.g. turn red valve, and then presented with a previously unknown environment against which it must autonomously perform the goal task. The intent of the proposed challenge is to provide future robots 1) that will work alongside as well as in advance of humans to take on greater parts of the workload, and 2) for science at distant locations, such as the moons of outer planets, to autonomously perform difficult science goals. The robots involved as testbeds for the challenge would be both the Valkyrie and Robonaut 2 humanoids, as examples of surface and in-space robots. This RFI seeks: (1) to gather feedback on the competition being considered, the prize amounts and distribution structure; (2) to determine the interest level in potentially competing in this challenge; and (3) to determine the interest level in administering the challenge (as an allied organization. Specific information sought is detailed in Sections 5-9. Responses should be submitted in Adobe PDF or Microsoft Word format (see attached template) and are limited to five (5) pages in length. Responses should include (as applicable): name, address, email address, and phone number of the respondent, business, or organization, with point of contact for business or organization. This RFI seeks feedback from potential competitors (Section 5) and from organizations interested in partnering with NASA to administer the challenge (Section 6). Comments must be submitted in electronic form no later than 11:59 pm Eastern Time April 4, 2015 to Mr. Sam Ortega at e-mail address: HQ-STMD-CentennialChallenges@mail.nasa.gov . Please use Space Robotics Challenge on the Subject line. NASA welcomes all segments of industry, academia, and government, including associations, innovators, and enthusiasts to reply to this RFI. This RFI is for informational/planning purposes only and the Government will not be responsible for any cost associated with preparing information in support of this RFI. This RFI is NOT to be construed as a commitment by the government to enter into any agreement or other obligation or to conduct a Space Robotics Challenge. This notice is issued in accordance with the NASA Prize Authority, 51 U.S.C. 20144. Responses may be made available for public review and should not include proprietary information. Submitted information will be shared within NASA and with contractor personnel associated with the NASA Centennial Challenges Program. All responses are to be for general access by government reviewers. NASA is considering the Space Robotics Challenge to quickly advance the autonomous capabilities of dexterous mobile robots, particularly those of humanoid format, while also providing complex robotic platforms for the robotics community on which to deploy and test their advanced software. The scope of this challenge involves tasks that humanoid robots would perform either in transit to or at locations (such as the surface of Mars) for deep space exploration missions. Future manned-missions to deep space destinations will likely require pre-cursor robotic mission to deploy and prepare habitats, power systems and other infrastructure. Furthermore once humans arrive, a need will exist for robotic astronaut assistants both in intra-vehicular and extra-vehicular environments. Some of these robots may be of humanoid form as to fit into astronaut environments without modifications. Manned and possibly unmanned transit vehicles may benefit from on-board robots for maintenance and contingency operations. More ambitious robotic missions to outer planets' icy moons will almost certainly require robotic manipulators similar to those of humanoids. Due to the large communication latencies between these distant destination and Earth, the robots should have autonomous capabilities to perform their tasks. It is also recognized that many of the robotic capabilities needed for future exploration missions translate into highly valuable functionality for terrestrial robotic applications, such as disaster relief and industrial plant maintenance and servicing. The target platforms for this challenge are the Valkyrie and Robonaut 2 robots at NASA JSC. While Valkyrie and Robonaut 2 have some autonomous capabilities that can fulfill a desired concept of operations, many more capabilities are sought. 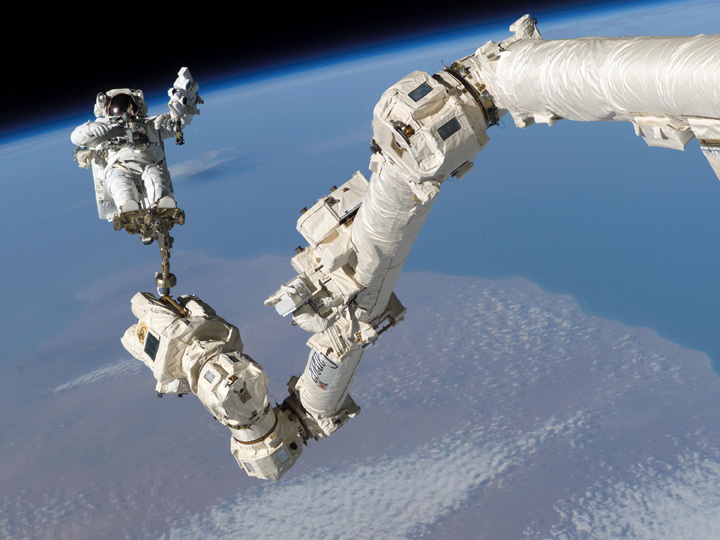 NASA believes that providing these platforms to multiple robotics research groups is paramount to getting the best of humanoid robot autonomy for success in future missions as well as to stimulate the progress for more capable terrestrial robotics and automation. The Space Robotics Challenge is currently contemplated as a dual level, two-track challenge. The Level I challenge would involve a virtual challenge competition in software simulation and the Level II demonstration challenge would involve use of software to control a robot to perform sequences of tasks. Both Levels of the challenge would have a Track A and Track B option. A competitor would pick only one track in which to compete. Track A would utilize the Robonaut 2 platform and focus on simulated in-space tasks such as space-craft maintenance and operations in transit to Mars, while Track B would utilize the Valkyrie robot to perform simulated tasks on planetary surfaces, such as pre-cursor habitat deployment on Mars, or disaster relief in an industrial setting on Earth. The challenge would award prizes for the highest scoring U.S. competitors in the Level I virtual challenge and the Level II demonstration challenge. For the challenge, Robonaut 2 would have autonomous climbing capabilities using International Space Station certified handrails and would operate in the Active Response Gravity Offload System (ARGOS) at NASA JSC to provide a 0g analog. This would allow Track A to focus on mobile manipulation in a microgravity environment. Valkyrie would have autonomous walking capabilities for smooth terrain so that Track B could focus on mobile manipulation and irregular mobility maneuvers on surfaces. Representative tasks expected for each track are listed below. Track A using Robonaut 2 platform: Swap out modular replacement units located 5 meters away; inspect inventory requiring handling of soft-good materials; repair and/or replace a damaged component to space craft (e.g. handrails, valves, solar panels); remove and replace internal panels for space craft inspection. Track B using the Valkyrie platform: exit a habitat airlock hatch and use a ladder to reach the surface; remove a communications/power cable from a soft-goods storage location and attach it to a connector located at least 10 meters away, while traversing an irregular ruble strewn terrain, like the surface Mars or a post-earthquake industrial plant; repair or replace damaged components on complex equipment, such as a broken valve or damaged tire on a planetary rover; move dangerous debris and collect or recover desired samples or items, such as industrial plant environment samples or Mars soil/rocks. Level I challenge tasks would be modeled after the physical challenge tasks, but would be performed in simulation. The key challenge requirements are to develop autonomous software that would allow for either supervisory or autonomous control modes to perform a complex sequence of tasks. The sequence of tasks would involve both mobility and dual-armed manipulation, on either a walking robot or a climbing robot (for in-space applications). The task in a sequence that shall be completed in autonomous mode would be revealed just prior to competition, so that generic approaches to autonomy are considered. For the Level I challenge, simulations of both Robonaut 2 and Valkyrie would be provided, with necessary environment dynamics. The virtual challenge would be competed online using cloud-based servers. Valkyrie and Robonaut 2 platforms would be available for preparing for the final challenge. Robots would be accessible at NASA Johnson Space Center, and NASA is currently seeking separate proposals for hosting Valkyrie robots around the country. Registration for the Level I challenge would begin in Summer 2015. Proposals would be required for team consideration in the Level I challenge. Winning submissions would be announced at the end of Summer 2015, with delivery of the simulations by early 2016. The virtual challenge would occur in September 2016. It is expected that up to 20 teams will be selected to compete in the Level I challenge (nominally 10 teams on each track). A mid-challenge review would occur for each of the selected teams in Summer 2016. This review would provide the administrators of the challenge information that may help in clarifying the rules further or modifying challenge tasks based on unforeseen simulation issues. Competitors would perform each of the challenge task sequences described in Section 3 in simulation without prior knowledge of the specific sequence or environmental details of the setting. Details of the environment would only be available via sensors, cameras and instruments onboard the robot. Robot operators would operate from a remote location to ensure that they only use data provided by the robot (or simulation thereof), and would have limited network bandwidth to provide mission plans to the robot. For the supervisory control mode, operators would be provided continuous updates of the environment as the task sequence unfolds and will also have the ability provide re-planned task sequences. For autonomous control modes, each team could use an initial scan of the environment, after which the teams would be given 10 minutes and a fixed bandwidth connection to provide the mission plan. After mission uploads, the robot would complete the task sequence autonomously without further interaction with the operators. Teams would have 1 hour to complete each sequence of tasks. Multiple runs would be considered. Task sequences are expected to be composed of multiple tasks and steps within tasks, with the successful completion of each successive step and task within time allocations scoring more points. The top 5 (2 for Track A, 3 for Track B) scoring teams would be eligible to compete in the Level II challenge. The AO would be responsible for handling the virtual challenge. The AO would procure cloud space for competitors to upload their software and to run the simulations. Tests of this simulation environment would occur no later than one month prior to the virtual challenge. The finalists for the Space Robotics Challenge would be announced upon completion of the Level I challenge in September 2016. The Level II challenge would occur in September 2017 at NASA Johnson Space Center. The AO would be responsible for setting up challenge environments at NASA JSC. Tests of the challenge environments would occur no later than one month prior to the Level II challenge. A mid-year review would occur with the final five teams in April 2017. This review would provide the administrators of the challenge information that may help in modifying challenge task sequences or environments based on unforeseen hardware or task environment issues. Further clarification of tasks and rules may also result from this review. Scoring for the final challenge would be the same as that for the Level I challenge. Upon a tie, the time required to complete the tasks would be used as tie-breaker, with the fastest completion time winning. Teams would have approximately 7 months from delivery of the simulation to prepare for the Level I competition. Teams would have approximately 11 months after Level I to prepare for the Level II competition. Both levels would have a mid-year review cycle to evaluate progress to date. For level 1 on either track: 1st Place $250K, 2nd Place $100K, 3rd Place $50K. For level 2 on either track: 1st Place $500K, 2nd Place $250K, 3rd Place $100K. Interest: A) Are you interested in participating in this competition? B) Are there any barriers that should be addressed in the timelines, requirements and formulation of these challenges? C) It is not intended to have competitors house robot hardware, but rather travel to hardware locations for intermittent testing in the second tier of competition. Does this present an unrealistic barrier for participation? Competition: A) Do the representative challenge tasks provide challenging enough activity based on today's state-of-the-art in robotic autonomy? Do any of them seem too challenging or too easy in the given timeline, considering they would be performed sequentially? B) Is each of the tasks described in section 3 appropriate, or are there other task sequences that offer a more compelling approach to developing, achieving and demonstrating autonomy? C) Does the remote environmental information and remote operations scenarios make sense? D) Does the limited bandwidth for robot commands ensure the desired outcomes in autonomy? E) Do the two modes, supervisory control and autonomous control, make sense as envisioned? F) Are there metrics beyond step and task completion and time-to-completion that could enhance scoring? G) Does the 60-minute challenge time provide enough or too little time for each task sequence? Awards: A) How could the award levels and distribution structure best incentivize participation and technical progress? B) Please comment on the award scenarios being considered. Are there alternative scenarios providing greater incentives to compete? Are you interested in partnering with NASA to plan and execute the Space Robotics Challenge as an Allied Organization? This RFI seeks feedback on the competition phases, the prize amounts and distribution structure, and/or interest in competing in any or all Challenge phases. Comments must be submitted in electronic form no later than 11:59 pm Eastern Time April 4, 2015 to Mr. Sam Ortega, Program Manager, Centennial Challenges Program at e-mail address: HQ-STMD- CentennialChallenges@mail.nasa.gov . Use "Space Robotics Challenge" on the Subject line. For general information on the NASA Centennial Challenges Program see: www.nasa.gov/challenges. In the event that NASA does initiate this challenge, NASA will post a public notice in the Federal Register. At that time, all individuals or entities that wish to participate in the challenge must register as members of a team and enter into an agreement with the designated challenge management organization. Only domestic teams are eligible to win prize money in the challenge. No team members may be from countries listed on the NASA list of designated countries. (The current list of designated countries can be found at http://oiir.hq.nasa.gov/nasaecp/ ).